Once upon a time i read about Bill Gates' smart house. And i thought - how nice would it be to have the curtains close and open automatically. Then i thought, why use curtains? 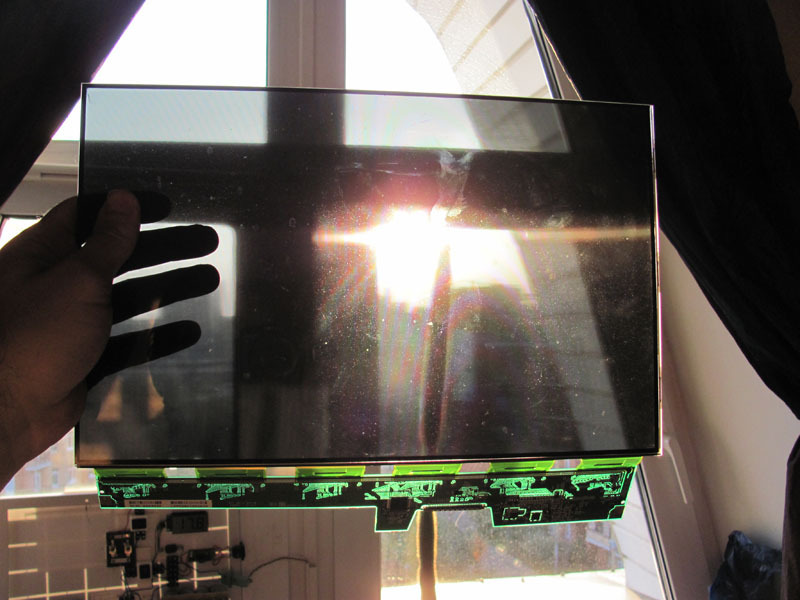 Just put a big Liquid Crystal screen in the window, and use that to enable or disable the light. Those were the days when the single LCD TV was standing prominently in the big mall with a multi-thousand dollar price tag below it, so i laughed at the idea and forgot about it. Some googling showed that there is pretty much nothing like the LCD curtains i was imagining. Some frosted/clear switchable "smart glass" and some aerospace stuff, but nothing that lets you flip a switch and block out the sunshine. 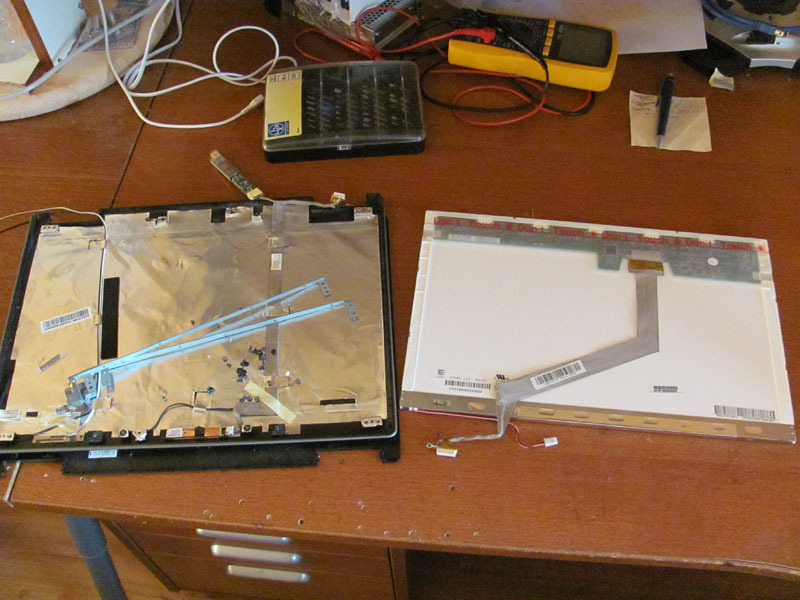 So, i dug up a screen panel left from a broken laptop. The frame contains the panel block and assorted things like the camera and the backlight inverter. 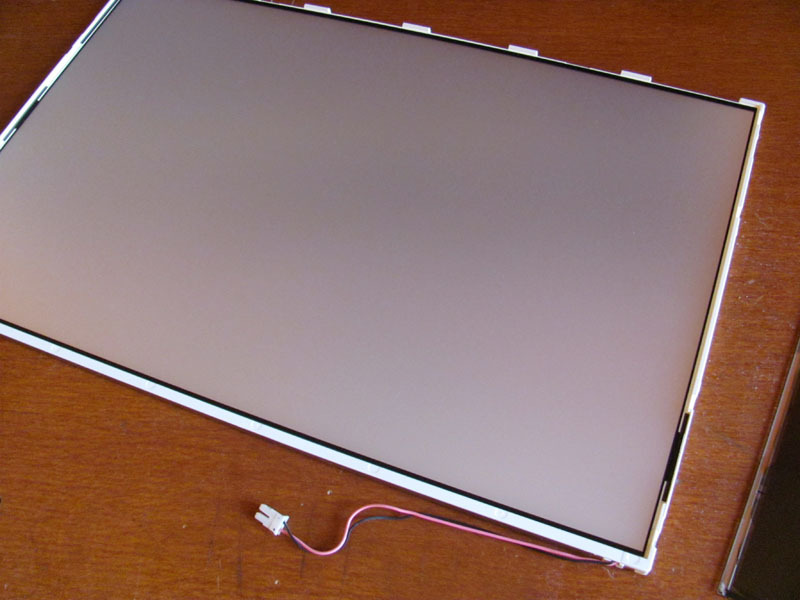 The panel block contains the backlight assembly and the LCD panel itself. The backlight assembly is made out of a stack of optical films with a CCFL bulb on the edge. I can't say that i understand completely how it works. There are two diffraction gratings, a big piece of plastic with notches, and several diffuse layers. Together, they do the job of turning a single CCFL into a flat, uniform field of light behind the screen. 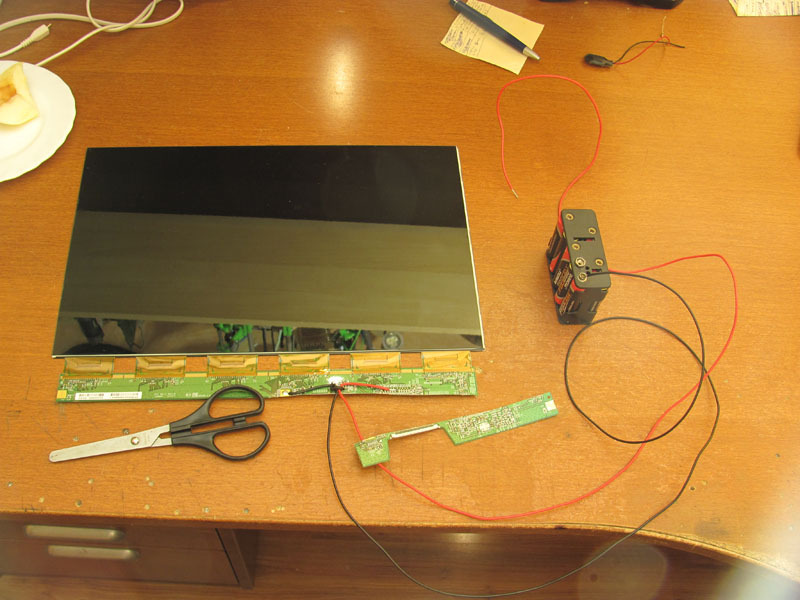 And the LCD panel itself is made out of, well, the LCD panel and the driver board. Now, what to do about it? 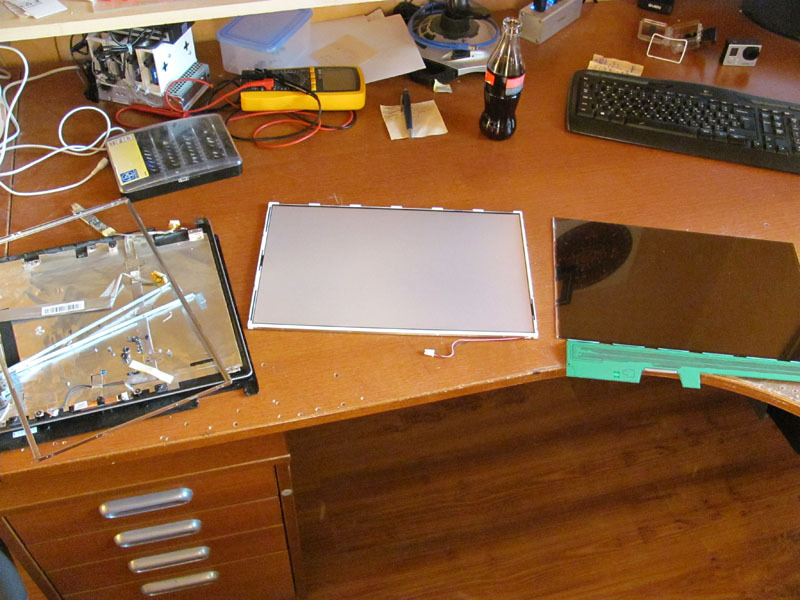 Driving an LCD panel is not exactly an easy task, you might say. It would be a complex or expensive insanity, you might say. But we don't need to drive it, we only need to make it go opaque or transparent as a whole. To do that, all you need is to find the bias voltage. 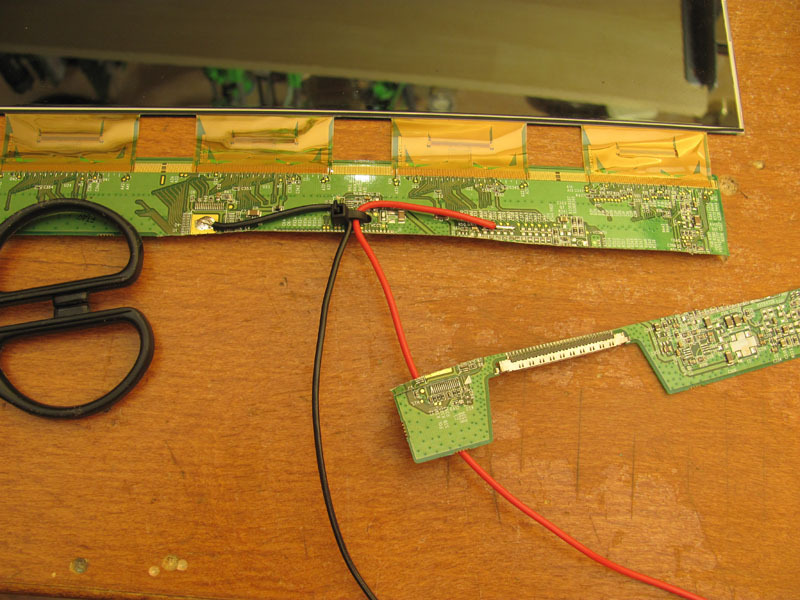 On every ribbon that connects the board to the panel there will be two spots for it, one per side, and all these spots will be linked to a single trace on the PCB. There will likely be small capacitors connected between it and the ground at each side. Take a 12V battery pack, connect the negative pole to the ground, attach a 10k resistor to the positive end and start poking at the suspected pins. Once the screen goes a bit darker, you found your pin. It's the only pin we need, so the rest we might as well cut off. Literally, since this removes all the chips and logic that would be consuming power otherwise. With the content removed, it no longer goes a little dim - it goes completely dark, since there is no longer a driver chip that fights you over what the voltage should be. And here is the finished proof-of-concept. It draws about 20 microamps, and if left disconnected it will gradually become transparent over a few minutes. Really, most of the power in these panels is used in switching them and even more is used for the backlight. The transparency is varied by varying the voltage on the panel. In the end, it's not the perfect curtains (and i have triangular windows...). There is quite a bit of distortion and the transparency isn't that great. 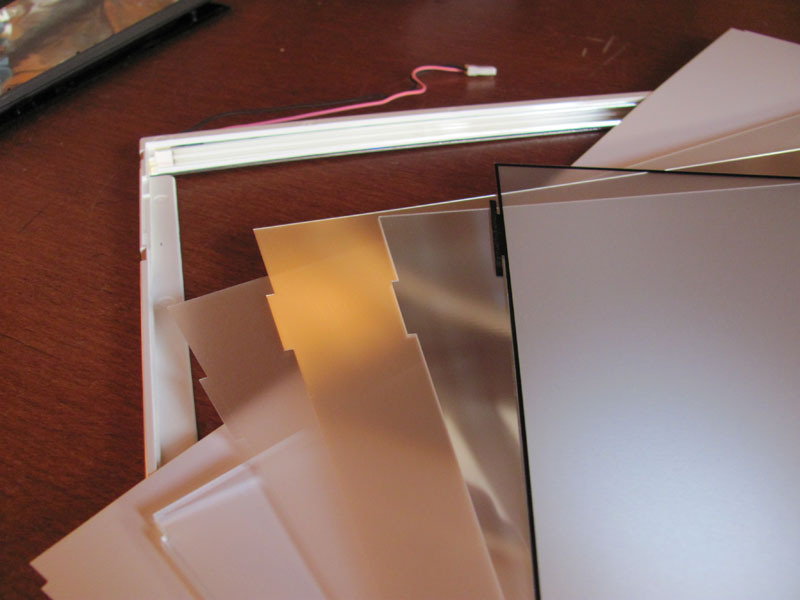 Anyway, i hope someone finds a good use for the idea - there are plenty of such panels in the garbage, and i can think of many non-curtain uses for a controlled-transparency glass.